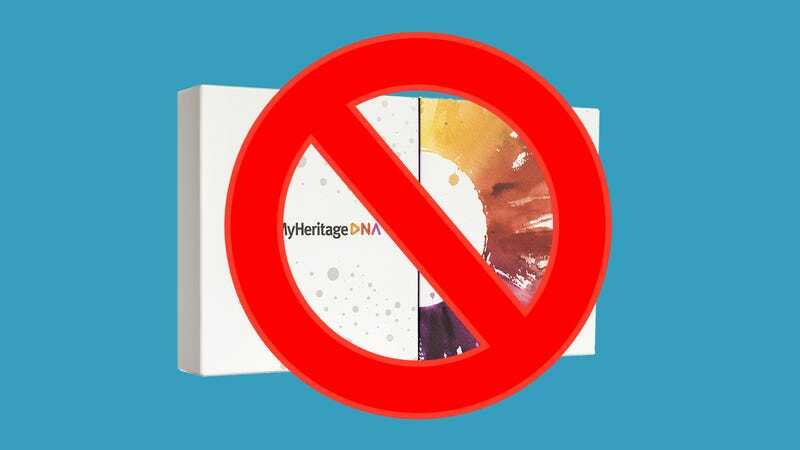 If you’d like to gift your loved ones the chance of unwittingly sharing extremely sensitive personal information, then a DNA testing kit may be the perfect stocking stuffer-sized present. But if you’d rather not have your mom or dad or girlfriend send away private health information with a tube of their spittle, we’d strongly suggest something else. “Gifts for the family historian,” heralds an ad for a Helix testing kit. “They can build a family tree, learn all about their ancestors, and take inspiration from the lives they led,” writes another kit purveyor, Ancestry. And it does sound like a great gift idea. Why not replace the boring wine club membership with a club that uses DNA testing to find the perfect, genetically optimized bottle of wine? Or get your gym-obsessed brother a test that offers insights into fitness and nutrition? Or your impossible-to-shop-for father a chance to discover his roots? Well, it turns out there are a lot of reasons why not. The biggest among them is privacy. When you spit into that test tube and send it off to be analyzed, you’re handing over access to extremely sensitive information about things including your health, personality, and family history. It’s all there in the fine print: Testing companies can claim ownership of your DNA, allow third parties to access it, and simply by virtue of possessing it make your DNA vulnerable to hackers. DNA testing companies aren’t necessarily doing anything outright fishy. In fact, most companies go to lengths to anonymize your data before sharing it, and to keep it secure. But sharing that kind of sensitive personal information comes with an inherent risk. Consumer genetic testing firms are not typically bound by HIPAA, which means the flow of your personal information is completely unregulated. And the more places your data flows, the more chances there are for it to leak. Even without an accidental leak, genetic data could be used against you. The Genetic Information Non-Discrimination Act allegedly prevents health insurers and workplaces from discriminating based on DNA, but gaps in the law mean that life, long-term care, and disability insurance providers can still legally make decisions based on findings from DNA tests. And despite those already lacking protections, if you choose to share your genetic information with a doctor, as you might if the results were medically relevant, it could impact the health coverage you receive. Worse yet, if an insurer asks you whether you have ever taken any genetic tests, you could be legally compelled to share information relevant to your health. Not to mention that the science behind many consumer DNA tests is shaky at best. Tests related to health and nutrition have been widely discredited by scientists, with the exception of a few tests for specific disease-markers offered by 23andMe that are FDA-approved. Ancestry tests are based on sound science, but variables in data sets and algorithms mean results are probabilities, not facts, as many people expect. And while DNA-deduced wine preference is a fun gag, you might have guessed that it’s not exactly scientifically rigorous. A boring sweater is sounding like a pretty good present after all, huh?